One striking feature of Basil's exegesis is the emphatic rejection of allegory in his interpretation of the creation account. Of course, by rejecting allegory Basil casts doubt on the value of much of Origen's exegetical work. This is particularly surprising in light of Basil's admiration for Origen. What was Basil thinking? 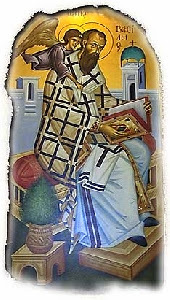 Earlier and with the help of Gregory of Nazianzus he had gathered a large collection of Origen's work into what he and Gregory called the "Philokalia". And yet when Basil begins to exegete and preach the opening chapters of Genesis, he casts allegory aside as a viable interpretive tool. Why? 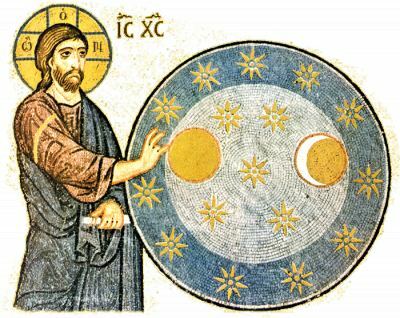 In his ninth homily on the Hexaemeron, Basil penned what Jaroslav Pelikan describes as "one of the most vigorous criticisms of allegorical exegesis to come from any orthodox Christian theologian in the fourth (or any other) century." I know the laws of allegory, though less by myself than from the works of others. There are those, truly, who do not admit the common sense of the Scriptures, for whom water is not water, but some other nature, who see in a plant, in a fish, what their fancy wishes, who change the nature of reptiles and of wild beasts to suit their allegories, like the interpreters of dreams who explain visions in sleep to make them serve their own end. for me grass is grass; plant, fish, wild beast, domestic animal, I take all in the literal sense. a figure to denote spiritual and incorporeal powers. In the higher regions, above the firmament, dwell the better; in the lower regions, earth and matter are the dwelling place of the malignant. So, say they, God is praised by the waters that are above the heaven, that is to say, by the good powers, the purity of whose soul makes them worthy to sing the praises of God. And the waters which are under the heaven represent the wicked spirits, who from their natural height have fallen into the abyss of evil. Basil diplomatically acknowledges this "theory as ingenious without being able to acknowledge the truth of it." As in the ninth sermon, he compares this kind of allegorization to a dream or "old women's tales". Instead, Basil insists "that by water water is meant." Basil especially criticized the allegorist's lack of hermeneutical control and linked the desire to allegorize to a fundamental dissatisfaction with the Bible's plain meaning. God has clearly told us, Basil argued, what we need to know for spiritual growth, edification and sound theological knowledge. The desire to move beyond God's revealed clarity to a hidden meaning is a sign of spiritual malaise. Shall I not rather exalt Him who, not wishing to fill our minds with these vanities, has regulated all the economy of Scripture in view of the edification and the making perfect of our souls? It is this which those seem to me not to have understood, who, giving themselves up to the distorted meaning of allegory, have undertaken to give a majesty of their own invention to Scripture. It is to believe themselves wiser than the Holy Spirit, and to bring forth their own ideas under a pretext of exegesis. Groups such as the Manicheans, Marcionites and Valentinians, Basil reminded his readers, employed allegory in their own interpretive distortions. While Genesis states that "darkness was upon the face of the deep", a darkness Basil describes as "meant in reality — air not illumined, the shadow produced by the interposition of a body, or finally a place for some reason deprived of light," the Manichean, Marcionite and Gnostic were quick to imagine a deeper meaning. "For them 'darkness' is an evil power, or rather the personification of evil, having his origin in himself in opposition to, and in perpetual struggle with, the goodness of God." The much safer hermeneutical path, Basil insisted, is to remain silent "about these metaphors and allegories, and, simply following without vain curiosity the words of Holy Scripture, let us take from 'darkness' the idea which it gives us." Basil linked the authority of the Genesis text to the movement of the Holy Spirit in Moses, insisting that the words of the text are inspired: "there is not one idle syllable." Thus, because the text itself is holy, derived from the work of the Holy Spirit, interpreters of the text must approach it with a reverent disposition.Whatever is said about the ideas of the text must match the exalted nature of its divine source. How earnestly the soul should prepare itself to receive such high lessons! How pure it should be from carnal affections, how unclouded by worldly disquietudes, how active and ardent in its researches, how eager to find in its surroundings an idea of God which may be worthy of Him! Basil has effectively laid a three-stage foundation for his exegesis: First, he has insisted that Scripture comes from the Holy Spirit. It is divinely inspired. There are no unimportant aspects to the text. Second, Basil reiterates that a holy text must be approached reverently, with a well prepared mind and heart receptive to the address of the text itself. Third, Basil rejects allegory as an appropriate hermeneutical strategy. The literal sense of the text will provide more than enough material for contemplation, insight and application. From Reading Scripture with the Church Fathers, Intervarsity Press, 1998, pp. 86-88.